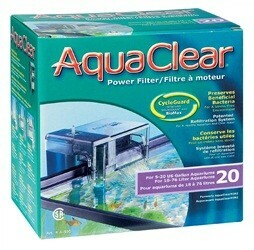 The AquaClear 20 Power Filter features a unique multi-stage filtration system that provides complete mechanical, chemical and biological filtration for superior water quality. The Power Filter has a filtration volume that is up to 7 times larger than comparable filters. It also allows superior contact time with filter media. The filter preserves beneficial bacterial creating a stress-free environment for aquarium inhabitants and maintaining clear aquarium water. Its unique waterfall design enables filtered water to return to the tank silently, gently breaking the surface tension and creating beneficial oxygenation. The Power Filter's patented flow control feature allows you to adjust the water flow according to your aquarium needs. The media basket prevents water from by-passing the filter media, maximizing filtration efficiency. Installation and maintenance are quick, easy and convenient. The filter comes equipped with AquaClear Foam, Activated Carbon and BioMax. AquaClear offers an entire line of media including Zeo-Carb and Ammonia Remover, exclusively designed for the AquaClear 20 Power Filter.